I have a HH son (Harry) aged 15 and a HH daughter (Mia) aged 2 and my HW daughter Cerys who is now 11 months old. We were dealt the devastating news that she had CHD at 20wk scan and had further scans at Leeds General Infirmary (LGI) it was decided that Cerys would be delivered by planned induction at LGI where all necessary staff could be available and on 30th Aug 2011, after a short labour, filmed by the One Born Every Minute team, Cerys was born. After all the trepidation of the last 20wks of pregnancy, our beautiful daughter was born. In pregnancy we weren't able to be told if she would survive pregnancy, or labour and I was thrilled when they let me try for a natural labour (on the understanding that if she struggled, I had a c-sect) they couldn't tell me if I would be able to have a cuddle, but to my absolute joy, I did and she was whisked away to PICU. When I got there I was amazed to see that she was on minimal monitoring and that she was doing well. Cerys was diagnosed with a rotated heart, coarctation of the aorta, complete AVSD and low heart rate, but after a scan we were told that things looked better than expected and instead of having surgery in the first wk of life, she could wait until she was 1-2yrs old. We were beside ourselves with joy. Unbelievable news!!!! We were going home!! But someone said that sometimes with her condition comes bowel issues so she was checked. It was found that Cerys had a malrotation of her bowel and if they had let her go home she would most likely have been readmitted as an emergency within the month for a twisted bowel, itself life threatening. 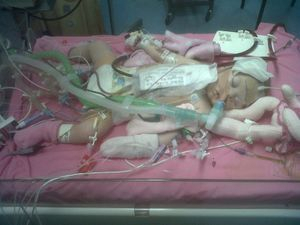 At 5 days old she had her bowel taken out, turned around and replaced and her appendix removed as it was on the wrong side. Gently, gently she was reintroduced to feeding and after another 2wks in hospital she was allowed home. Our story upto then is on DVD from OBEM. Life was good and relaxed at home for 5wks. We were so happy - and then we had a cardiology appt with an LGI doctor at our local hosp. He said that he was confused and worried - the BP in her lung suggested that the problems in her heart were worse than they had found - but he said that he would see us again in a month - but 8 days later, Cerys crashed in my arms at home. She went floppy, non responsive, glazed staring eyes and was making a strange sound. She was blue lighted to my local hosp. At my local hosp, it took 6hrs to stabilise Cerys. I have never been so scared in my life. The doctor said it was the most difficult thing he has had to do. They lost her, but got her back. She was blue lighted to Sheffield Childrens hosp. She spent another 3days at Sheffield, still hadn't opened her eyes - no excuse for her collapse in her blood results - was blue lighted to Leicester. After a couple of days in Glenfield PICU she opened her eyes - I have never felt the emotion before that I did at that moment - she was sent up to the ward. Amongst all the uncertainty of what had happened and what was going on, 5 different hosps discussed Cerys and what to do and where to do it and I put my foot down and said that if Glenfields were able to do it, then we weren't moving!!! And on 28th Nov 2011 she had a 1st stage Norwood (12wks old - that should be done in 1st wk of life) she was on ECMO for an amazing 26hrs after being told it would be at least a wk - she amazed the surgeons and everyone she came into contact with - came off morphine quicker than she should so that we could go home on xmas eve. 7wks later. While in hosp, we had missed bonfire night, my birthday, Mias birthday and we weren't ready for xmas - so we rushed around and did all the shopping and had it all on New Years Day. Perfect. We had xmas decorations, food, presents, fireworks and set off paper lanterns - everything we would have done if we had been at home. I didn't see Mia and Harry for 3wks after Cerys had her OHS because she looked so ill - and they themselves were ill.
Cerys is now waiting for her 2nd OHS, but they want her to be between 10-15kgs because of her circulation, if they do surgery 2 it will partially do surgery 3 and she isn't big enough for that. She continues to do well, has half a functioning heart, slightly narrow aorta and high BP in her lung - with SATS of on average 75% and catching up on her development, is a happy little girl with a smile that lights up a room.